Making predictions is hard, we all know that. But there’s one field where prediction can be even more difficult than prognostication about the houses we’ll be living in and the cars we’ll drive—the kinds of jobs we’ll have. Experts are always trying to figure out where society is heading and trying to determine what kind of new jobs people will be doing in the future. And those kinds of predictions always seem to bring out some of the nuttiest ideas when society doesn’t necessarily follow the path that people were expecting. The late 1980s and early 1990s was a time of massive upheaval for job seekers. Automation was putting a dent in both white collar work and manufacturing jobs, leading experts to worry that massive retraining would be in order. And they weren’t altogether wrong. But some of that upheaval —especially when it came to physically exploring alien places like the moon and the oceans—didn’t pan out. A syndicated article published in the September 5, 1988, edition of the Press and Sun-Bulletin newspaper in New York talked with a number of experts about what the jobs of tomorrow would look like. The article first quotes S. Norman Feingold, a clinical psychologist and career counselor who died in 2005. Feingold envisions a range of exotic careers: Ocean hotel manager, wellness consultant, sports law specialist, lunar astronomer and even robot trainer. Almost everything on his list is a real job today, aside from maybe “lunar astronomer.” And there aren’t many “ocean hotel managers” in the way that 1980s futurists would have imagined them. We were supposed to have vast cities under the ocean waves by now. 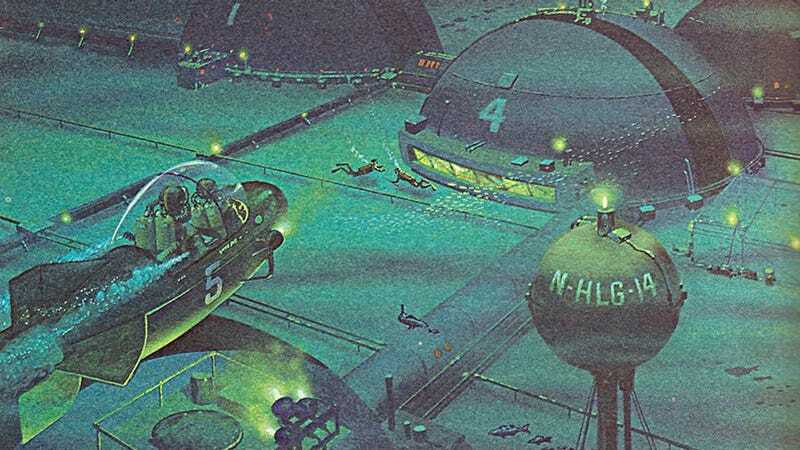 Or, at least, cities on top of the oceans—not unlike the anarcho-capitalist fantasies of seasteaders today. But the article didn’t just talk to Feingold. The piece also quotes the George Tech engineering professor Alan Porter who gave his opinion on the future of fast food. He predicts such innovations as “the Autoburger,” a fast-food dispensary something like McDonald’s, but without human workers. This prediction also feels like it’s incredibly close to being a reality, if not completely mainstream yet. McDonald’s has rolled out some highly automated restaurants, but humans still bring food to tables. Caliburger in Pasadena, California, has a robot burger-flipper named “Flippy.” And Creator, a company that sells a burger-making machine, opened a “robot restaurant” this summer. But much like the disappearance of cashiers at supermarkets and big box retailers, getting rid of the human doesn’t necessarily make anything more efficient. It often just transfers the labor to the consumer. Marvin Cetron, a technological forecaster, looks at the year 2000 and predicts a 32-hour work week. “The only job a woman won’t be holding is Catholic priest,” he said. Cetron said college students of the future will study enzyme research and genetic and robot engineering. You need to be computer literate? That seems like a no-brainer, given the benefit of hindsight. Just don’t tell the head of Japan’s cybersecurity, Yoshitaka Sakurada. The 68-year-old has never used a computer even once. Sakurada has “secretaries” who do that work for him. He’s the last of a dying breed, to say the least. And good riddance. What do you suppose the jobs of 30 years hence will entail? I suspect that plenty of “experts” will probably talk about retail drone delivery engineering and Hyperloop technicians and terraforming specialists on Mars. But none of those things are a given. And while “Martian safari guide” does sound like a cool, futuristic job, there are quite a few things that have to happen before we make that dream job a reality.